Set one mile back from the Arusha Moshi highway, in a quarter acre of scrub land, is Hilda and her family. In her Shamba (Swahili for a small farm) she is one busy lady! She started with a grant from Mondo to grow and sell mangos three years ago. She still sells mangos and has twenty large trees providing a fulsome harvest. More recently, she took out a loan to buy a cow. 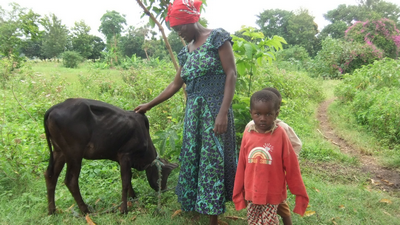 Using a local breed, tough and resilient to disease, she now feeds her three children with good milk. The original cow had two calves, one of which she sold. The two remaining cows, mother and daughter, have again calved and so a steady stream of income is produced. Recently she took out a second loan to buy pigs and now has three of them, all awaiting piglets! Hilda looks after her elderly father and three small children. The eldest attends school, a 30 minute walk away. The family are in good health, and Hilda has created a secure livelihood. She employs a full time worker to help with the animals and a part timer to collect mangoes and take them into Boma Ng’ombe market. If you would like to help support more women like Hilda, we are currently raising funds for our next round of grants and loans. To help us achieve our target you can donate here. Improving Education Project: Onwards to Nepal!